The bad thing about becoming a semi-legitimate film critic and getting to see movie screenings before the release date is that after the movie is eventually released and your friends call you up to roll to the show, unless said movie is like FANTASTIC, you probably don’t want to sit through it again. Take the ‘Transformers’ for instance. I can pretty much guarantee you that my good friend Keith, who is an expert in all things Transformers (believe me when I tell you this), is going to call me up and ask me to roll out with him to catch director Michael Bay’s 200 million dollar extravaganza. Sadly, I’m going to have to tell him that there is no way in Satan’s Hell that I’m going to sit through this for another two and a half hours. Hold up now! Before I get my e-mail box assaulted with Viagra spam time bombs, I didn’t say that ‘Transformers’ wasn’t any good and I’ll be shocked if you see anything as visually masterful as this movie was for say, the next five years, I’m just saying that once is more than enough for me. As our film opens we are greeted with the powerful voice of Peter Cullen reprising his role as Optimus Prime, narrating a brief but perfunctory explanation of why machines can walk and talk and how they happened upon the planet earth. It doesn’t take long for the action to start as we are introduced to a squad of American Soldiers in Iraq who spy a Skiorski HH-53 attack copter flying towards their position, one they thought had crashed and burned some months ago. When this thing lands on the base, it lands on the base something fierce transforming itself from the helicopter into the Decepticon known as Blackout and it does major damage. I’m talking MAJOR DAMAGE! After witnessing this scene, I’m thinking that this movie can’t get anymore visually spectacular than that! But no, that would be only the beginning. Now it’s time to introduce the human element into the movie, which is by far the weakest part of this film. Sam Witwicky (Shai Lebouf) is a high school junior who’s has just garnered enough loot to buy his first set of wheels. At the dealership, run by used car shyster Bobby Bolivia (Bernie Mac in a funny cameo), he spies a beat up ’77 Camaro that despite its wear and tear has some hidden qualities that compels the boy to buy it. Well there’s more to this car than meets the eye as Sam would learn since this car seems to be alive. 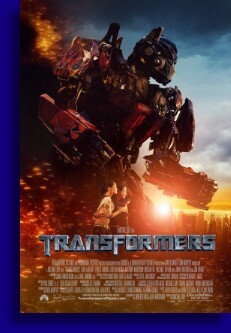 So the plot of this movie involves a pair of eye glasses that belonged to the boy’s granddad and are in Sam’s possession as these eyeglasses hold the location of a huge cube like device called the ‘All Spark’ which we are told created the robot world of Cybertron. Cybertron unfortunately was destroyed during the robot wars, but this cube has the ability rebuild a new robot world and also has the power to turn average electronic devices into living, talking, armed robots. Decepticon leader Megatron (voiced by Hugo Weaving) apparently crash landed on earth chasing this thing centuries ago, and was frozen on ice somewhere beneath Antartica before he could enact his plan to transform earth into Cybertron 2. Now it’s a race between Optimus Prime and his band of Autobots to stop a revived Megatron and his evil band of Decpticons before Megatron and them take this ‘All Spark’ and destroy all of humanity. You absolutely have to see this movie. And I’m telling you this even though I don’t really think that the movie itself is all that good. The robot effects in this movie are so incredible, so spectacular, so amazingly stupendously supercalifragilistically dope stupid fresh krazy wicked, that they have to be experienced on the big screen to be believed. Who was the star of this movie? George Lucas’ Industrial Light and Magic is the star THIS freaking movie, that’s who. I thought ‘Spiderman 3’ had raised the bar on special effects to unreachable heights, but ‘Transformers’ KILLS what ‘Spiderman 3’ was able to do. Even if you had no intentions of seeing this flick and you don’t know the difference between a Transformer and a See n’ Say, you should still go see this movie on the strength of its effects alone. Now I’m going to tell you the truth now because quite honestly the bravura special effects is about all this movie has to offer. We all know that Hasbro created The Transformers back in the early 80’s not as some insightful, imaginative TV show idea, but as a marketing ploy to sell action figures, and it worked out brilliantly. This movie seems designed not only to sell even more action figures, which I’m sure they will do bang up business on, but also to sell GM branded cars since GM is like the main sponsor of this movie. I halfway expected to hear ‘Like a Rock’ or ‘This is our Country’ during some of the action scenes. Along the way we are introduced to a crapload of other human characters who are supposed to serve some purpose or another, but these are basically cardboard cutouts of real people, reciting dialog that is trite, contrived and clichéd, and are put into this movie solely to provide bridges between the awesome robot battles and provide unneeded humor. The Robots actually possess more humanity the human characters shoehorned into this movie. I know folks like to crap on director Michael Bay but I will you tell this, he hasn’t made a movie better than his first one, which was 1995’s ‘Bad Boys’ and that includes ‘Transformers’. The great Steven Spielberg served as executive producer on this film, but had Spielberg directed, ‘Transformers’ would have been an infinitely better film. Spielberg the Director would have found a way to make you care for the human characters as well as the robot ones and as such ‘Transformers’ would have been a really, really good MOVIE instead an amazing two and a half hour technical demo of the advances of CGI imagery. But you still got to see it. The technical wizardry was such that it has to be seen to be believed. There’s no way they could have made this movie fifteen years ago. Hell, I don’t think they could have made this movie last year as amazing as it looked. We’ll have to see what the future holds for the inevitably sequel to see if the actual movie part can improve or rise to the level of the unequaled technical magic of the ‘Transformers’.